Texas Info Media provides turn-key solutions for Digital Signage system installation. We work with businesses in Texas, across the United States, and around the world. Our team offers complete solutions include design, installation, display monitors, mounts, media players and content software. Both Network or Stand-Alone Signage systems available. We make sure that you have the digital signage system that you need and one that can integrate with any current commercial audio & visual systems. Ideal products and services for any Corporate Lobby, Bank, Church, or Restaurant. Whether a large enterprise project or single display, we have your solution. View our portfolio to see more of our commercial audio & visual installation work. Digital Signage refers to the use of modern display panels, digital content and Internet technology to deploy a network of rich-media signs to replace traditional print signs. 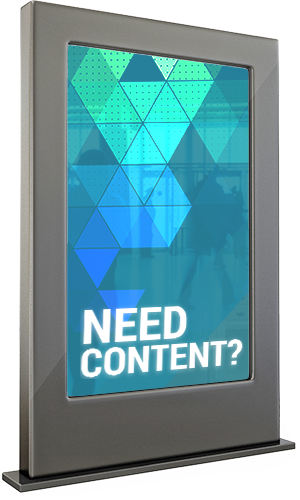 Digital Signage is a new generation screen-based media and communication networks created to deliver dynamic advertising and communications at various out-of-home locations. We can also supply and create your message from basic information to a dynamic and interactive presentation. Call 903-504-8092 Or Fill out the form below!